I am creating projects for the 3 year old class on Wednesday nights this quarter, and I thought I would share what we did. 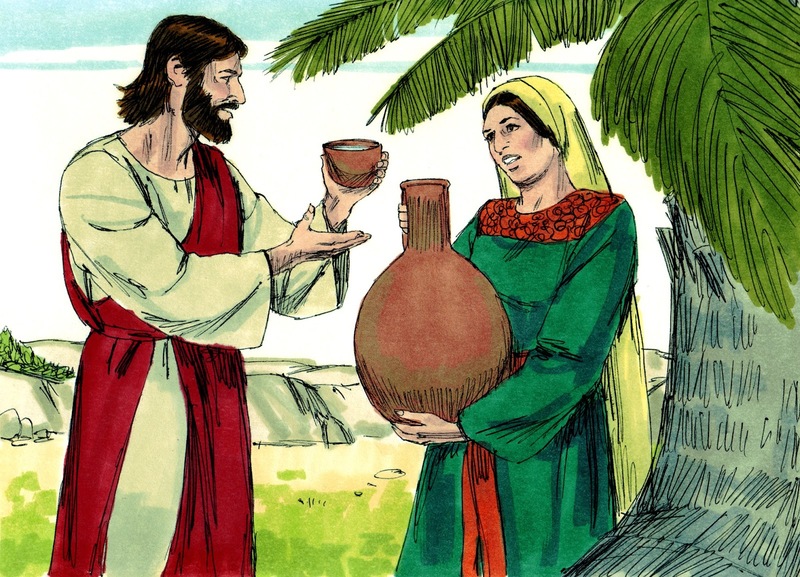 This includes the lesson, map and craft for Jesus and the Samaritan Woman. After a prayer and songs, we begin with Bible Facts Review. What is this? The Bible What are the two parts? Old & New Testament What is the first book of the Old Testament? Genesis Say Genesis 1:1 together. What are the first books of the new Testament? Matthew, Mark, Luke & John The tell us about the life of Jesus and are called the Gospels. Our lesson is found in John (4). Let's look at our maps: Jesus was leaving Judea and was going to Galilee. As you can see, Jesus had to travel through Samaria. Jesus decided to stop and rest. He stopped in a city called Sychar by a well named Jacob’s Well. Jesus was so tired, He sat by the well. The Disciples left to go into the city to buy food. 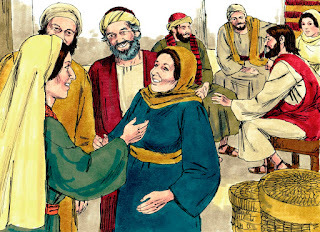 There was a woman from Samaria that came to the well for water. 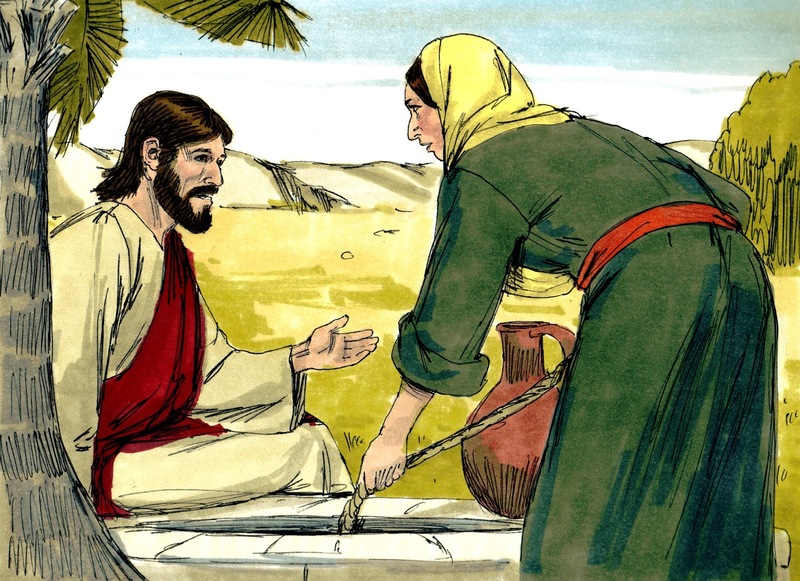 Jesus asked her for a drink of water. The woman from Samaria asked Jesus why He would ask her for water! She said Jesus was a Jew and she was a Samaritan. Jews and Samaritans did not have anything to do with each other! 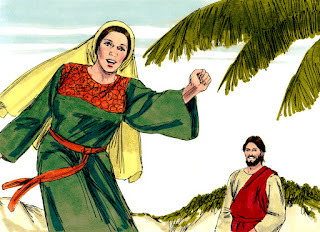 The woman told Jesus He must be a prophet! Jesus told her that the way of worship was changing. The people wouldn’t be worshipping under the Old Law. 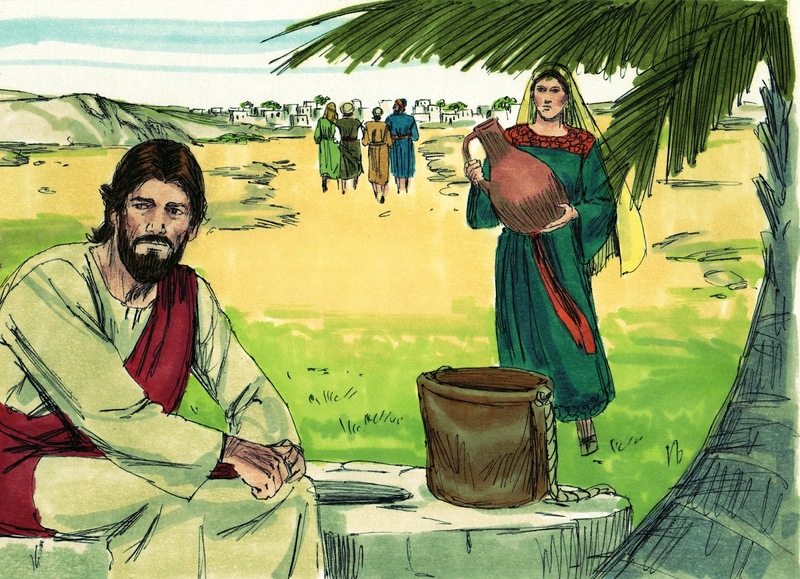 The Samaritan woman told Jesus that she knew the Messiah was coming and He is called Christ. He is coming and He will tell us what we need to know. Jesus told her that He is the Messiah. At this time, the Disciples returned from the city and they couldn’t believe that Jesus was talking to a woman. 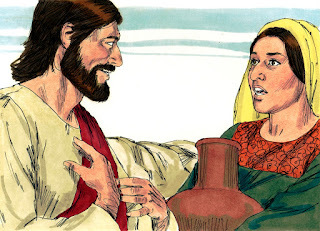 And, she was a Samaritan woman! They didn’t say anything, though. The woman left her water jug at the well and returned to the city. She told some men what Jesus had said and asked if He could really be the Christ? They left the city and went to see Jesus at the well. Many of the people that lived in Samaria believed in Jesus because the woman told them what Jesus had said. The Samaritan people begged Jesus to stay with them, so He stayed there for 2 days. There were many believers in Jesus. The people didn’t believe because of what the woman had said, but when they heard what Jesus said, they knew He was really the Christ that they were waiting for. He was the Savior of the world! For the Samaritan Woman at the Well project, for preschool, I decided to use Jesus loves us all. We used this windsock and I purchased these stickers at Oriental Trading. I also had heart stickers for the kids to add. Directions are included. The color and black & white are both included. They loved this project, but some students wanted to keep theirs flat (like a poster). Most did want it like a windsock once they saw how it looked finished. So, we let them decide which style they wanted. Click here to download. Click here to download the map with Jesus and the Samaritan Woman Stand-Ups. Click here to download the visuals for this lesson. Click here to download these pictures to color. super creative! thanks for all your hard work and for sharing!